This is an 18 minute video tutorial for my 1st and 2nd grade coding club students, demonstrating how to use the draw tools in Scratch Jr (for iPad) and add some basic blocks to make characters (sprites) interact. This is based on a lesson included in the book, “The Official ScratchJr Book: Help Your Kids Learn to Code” by Marina Umaschi Bers (@marinabers) and Mitch Resnick (@mres). I added this video tutorial to a YouTube playlist which includes other PBS Scratch Jr. videos I’ve made along with my husband, Wes Fryer (@wfryer). Last year I taught several coding clubs for elementary students using “regular” Scratch, and those resources are available on my school teacher website: mrsfryer.casady.org/home/scratch. I will introduce this snowman activity in Scratch Jr. this week to my 1st and 2nd graders. This is our third meeting. In the first two classes, I introduced coding vocabulary and basic movements through several “unplugged” (offline) activities inspired by Code.org’s “CS Fundamentals Unplugged” lessons. I also used these offline coding activities after Christmas break with my 3rd grade language arts students. If you use this tutorial with your own students, have questions or feedback, please reach out to me on Twitter @sfryer! This semester instead of coding classes, I am teaching two after school classes for 1st, 2nd, 3rd and 4th graders on creating stopmotion movies. We are using iPads for stopmotion. In this post I’ll share about the apps we are using and some of our lessons learned. We have mainly used the iPad app KOMA KOMA to get started, since it has simple features and provides an easy interface to help students develop basic stopmotion skills. I wanted to eventually use an app with more advanced features, like green screen/blue screen effects and music, so we also tried StikBot Studio. Unfortunately, however, it crashed a lot when students would preview their movies in the app, and this was frustrating. 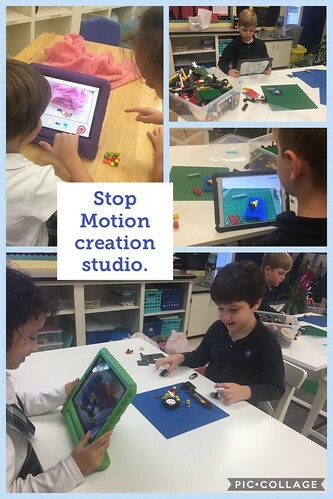 The students really liked being able to add special effects and music, and learned to persevere and work around the crashing issues with StikBot. Hopefully an upcoming update will resolve those stability issues, because it really is a great app and it’s also free! At our fall STEM night for parents and students, in my classroom we used KOMA KOMA to create simple stopmotion stories using a variety of different materials. This is a resource page of stopmotion examples I shared with parents and students for inspiration. To help students in my afterschool club learn stopmotion skills, I challenged them to use different kinds of materials in their movies each week. These moved from simple to complex projects, and eventually included green/blue screen effects and music. We ended with using objects: legos, mini-figures, Matchbox cars, etc. We have one class period left in our eight week session, and I really want to help my students share some of their favorite projects into Seesaw. This will allow them to share their learning with their families and classmates. It will also allow us to share our work with a wider audience! What I love most about helping students create in this type of environment is the way they develop their collaboration and teamwork skills. Most students went home and got the apps we used in class, and this encouraged them to extend their creative learning beyond our after-school time. If you have not yet introduced stopmotion moviemaking to your students, I encourage you to give it a try. Our 9th grade daughter used KOMA KOMA for some of the sequences in this 3 minute video she made for a Honors Biology project on Photosynthesis this month. It’s pretty amazing how creative and effective storytelling and communication can be using these tools and strategies! UPLOADED: The…. Process of Photosynthesis? No I have not turned into an animation channel! This is another remarkable and inspiring Stopmotion example, created by an 8th grader who is a cousin of one of my third grade students. It’s about malaria and Youyou Tu, who was awarded the Nobel Prize for her work in developing an innovative treatment for malaria which has saved millions of lives worldwide. This past week I led two coding camps. Both were 4 day camps, which lasted 3 hours each day. The morning session was for 1st through 3rd graders, and the afternoon session was for 4th and 5th graders. A few of the students had participated in my Spring 2018 after-school Scratch Club, but most were new to coding. In this post I’ll share some of the apps and websites we used, both “plugged” and “unplugged” activities we did, and some of my lessons learned. I’ve shared all the lesson plans I developed in this Google Drive folder. I drew lessons from both Code.org’s elementary “unplugged” activities (“CS Fundamentals Unplugged”), and from PBSkids Scratch Jr. lessons. Direct links to those websites and resources are included in each lesson plan. All of these lessons and resources are available free. One of the most important elements of the week was developing our coding vocabulary. 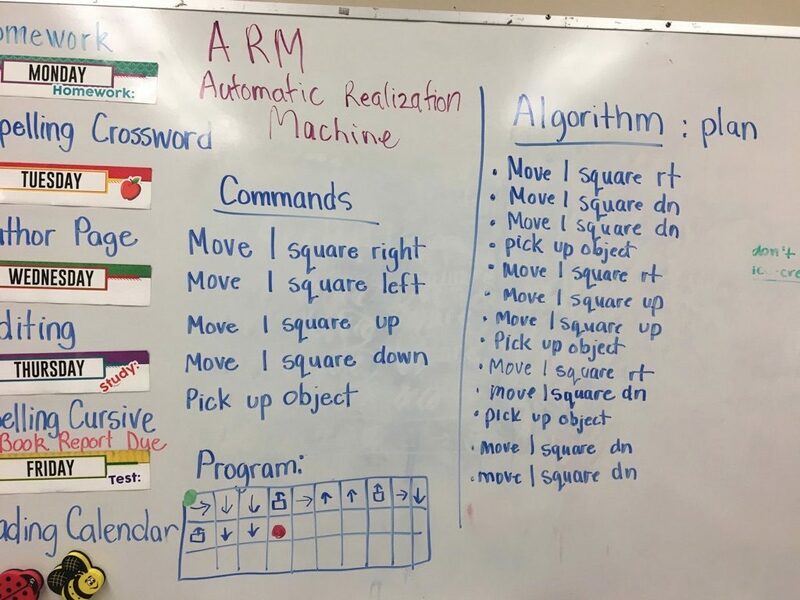 Algorithm, program, debugging, binary, patterns, looping, repeating, and digital citizenship were all terms and concepts we learned about together. All of these terms came from the Code.org unplugged activities. 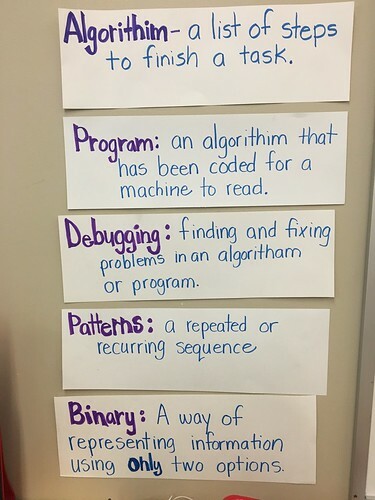 I love how coding can open the door to interdisciplinary and cross-curricular connections for students. 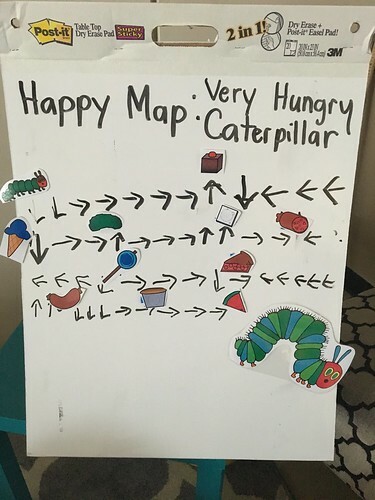 One example of this was our coding of “The Very Hungry Caterpillar” by Eric Carle. I created this lesson as a remix / modification of Code.org’s “Happy Maps” unplugged activity lesson model. We began each coding camp half day for my younger students with an unplugged lesson. 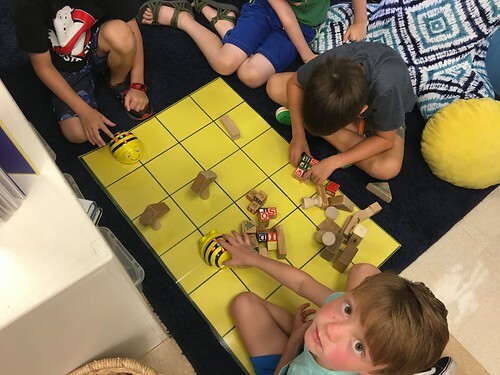 This was followed by coding activity stations, which included the Bee-Bot and Bee-Bot robots, as well as the Osmo apps Coding Awbie and Tangram. Younger students used only iPads for their coding activities. Each day we included a break with time to go outside for recess, and this provided an important brain break with unstructured play time outside. We also had a snack during our break. 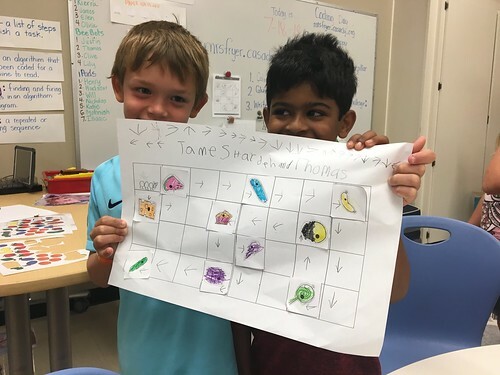 This schedule and lesson sequence allowed students to engage in paired coding, which is strongly encouraged by Code.org in their CS Fundamentals courses. This past spring, I completed the Code.org teacher training with a face-to-face workshop in San Antonio as well as follow-up monthly webinars. Code.org provides free training for teachers who want to learn how to teach and lead coding lessons with their students. After our break we used PBSkids Scratch Jr. lessons and design challenges. The lessons and videos provided context and inspiration for students to explore the coding blocks and create their own programs. 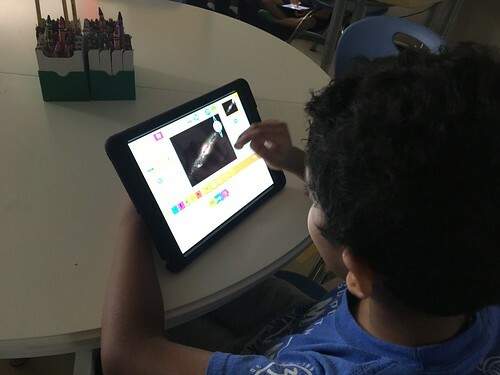 One of the things I love the most about bringing Scratch Jr. and the Scratch program to my students is how they use these platforms for open ended creativity. They love drawing, recording their voices, and making things disappear! These invitations to open-ended creativity provide a nice balance to the lessons of Code.org. Code.org lessons tend to be more scripted and puzzle oriented. Both are great, and can compliment each other. My students enjoyed both in our coding camps this week. In the afternoon with my older students, our coding camp time started with open exploration. Just as we know from working with students using math manipulatives, students need opportunities to play and explore independently before participating in guided instruction. This lesson sequence worked well for my students. Instead of promising students “free time” if they finished early, every student had about 30 minutes at the start of our camp each day to play. After open exploration and play time, each day we completed an “unplugged activity” which focused on vocabulary and building basic coding foundations. 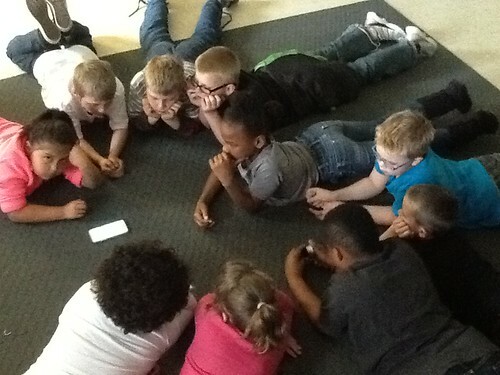 One of my favorite lessons was the digital citizenship video and conversation we watched and had our last day together. When I shared this video with my students, I played it from my lesson plan link using SafeYouTube.net, which removes (free) all advertising, comments, and related videos. After the unplugged activity, our break and snack, we jumped into “Getting Unstuck” coding challenges using Scratch on our Chromebooks. Getting Unstuck is a 21 day challenge currently being facilitated worldwide by the Creative Computing Lab at the Harvard Graduate School of Education. These challenges were great because they provided simple prompts that introduced my students to different Scratch blocks. We were also able to view many projects created by others, which were both inspiring and simple to remix. I loved the simplicity of these coding challenges! You can check out all of the projects my students created and shared in this Scratch Studio, which is a gallery of projects. We ended each day by writing in our reflection journals, which is a strategy suggested by Code.org. I printed a Code.org reflection journal for each student, and this proved to be a wonderful way to wrap up our intensive half-days of learning. The reflection below was one of my favorites from the week. “Today I learned it’s ok to remix.” Indeed it is, and the Scratch community provides the perfect environment to learn both that lesson as well as many other important lessons we are emphasizing in our school’s Digital Citizenship initiative. I recorded some wonderful videos of my coding camp students reading their code, explaining their thinking, and demonstrating their algorithms in action. I will share those here later, after I am able to contact the parents and get their permission to share them publicly. If any of the ideas, resources or links I’ve mentioned here are helpful or inspiring to you, please share a comment or reach out to me on Twitter @sfryer. I can’t want to continue coding and learning with my students in the school year ahead! My third grade students have spent the last month on an animal research project. In addition to learning about their selected animal and the research process, it was important to me this year to teach students about documenting their sources and giving appropriate attribution to the information they use. Even at a young age, students need to learn that when we use someone else’s ideas or materials, we need to give them appropriate credit. This is important for digital citizenship as well as digital literacy. Includes images and videos about animals which are free to re-use, and also include attribution right on the photos and videos! 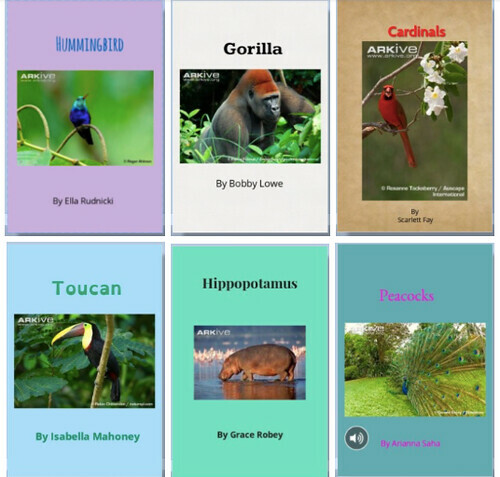 In the past, my students have used the Book Creator app on iPads to create books about their research. We published these eBooks by exporting them as videos, and posting them to our classroom YouTube channel. This year for the first time, we used Book Creator’s online version (app.bookcreator.com) so students could create their eBooks using our shared cart of Chromebooks. This worked so well! Students were able to login using their school Google accounts, and could work on their books from home or anywhere at school. Students selected their animal and begin to collect research from library books, magazines, and online sources which I pre-selected for them and shared on my classroom website. These are all kid-friendly websites or search engines. (It’s important at this age to NOT just “turn students loose to Google without guidance.” Arkive.org was one of the primary and favorite web resources my students used in this project. Students hand wrote (on paper) their rough draft / sloppy copy, and helped them with some preliminary editing. Students then typed their next revision into Google Docs, and we used Google Classroom (for the first time, for me and for them) to streamline this process. I loved this workflow, it made it so much easier for me to make comments and notes on student papers in Google Docs, and also keep track of where students were in the writing process. After students were finished typing their final version and completed editing in Google Docs, they copied and pasted their paragraphs into a book in my shared teacher library using Book Creator Online. Check out all our finished eBooks by clicking on different book covers in this Google Doc. This is the document I’m sharing with parents so they can view their child’s completed book and other student books, using the shortened web link bit.ly/fryerbooks. This Google Doc is also embedded on our classroom website. This summer I accepted a new third grade teaching position at Casady School in Oklahoma City. For those not familiar with Casady, it is an independent school in northwest Oklahoma City, serving approximately 900 PreK through 12th grade students on a beautiful 80 acre campus. 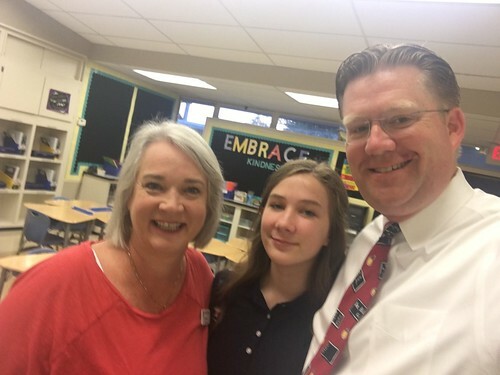 Casady is part of the ISAS (Independent Schools Association of the Southwest) , and teaching there gives me an opportunity to join my husband (who is the Director of Technology at Casady) as well as youngest daughter, who is a Casady 8th grader this year. Teaching at Casady is providing me with a unique opportunity to work with students in a very different socio-economic situation compared to those I taught for the past four years at Positive Tomorrows. I am frequently asked the question, “How is teaching students at Casady different than it was at PT?” I have found more similarities than differences so far between these two student groups, and in this post I’ll highlight some of the things I’ve observed. All students need to feel safe, both emotionally and physically. Students often express concerns and occasionally fears about being bullied by classmates. 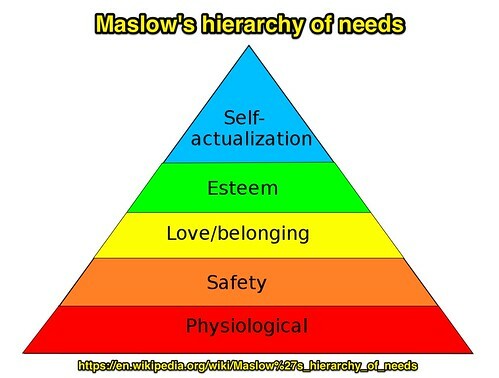 Maslow’s hierarchy of needs tells us that we must help provide for the psychological and safety needs of people first, and then attend to their need for love and belonging before we can effectively teach or learn about the curriculum. 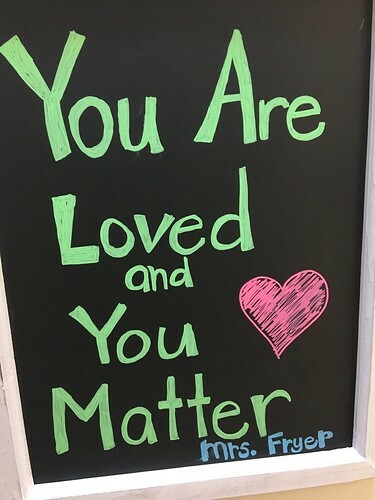 My years of teaching at Positive Tomorrows helped me become much more aware of the socio-emotional needs of students, and the importance of being sensitive to their unique situations each day. My abilities to “read kids” and get a sense for how they are feeling emotionally have helped me at Casady just as they did at PT. Students experience anxiety both inside and outside the classroom. The reality of these anxieties are evident in both groups of students, so “anxiety is not a money-thing.” Anxieties are different, but they are present and important to recognize for all students. One of the things I enjoyed most about teaching at Positive Tomorrows was the opportunity to set up my classroom with flexible seating and to provide students with choices about where and how they learn best. Casady has a more traditional classroom model than PT, but I have been able to create places in our classroom using carpet, pillows, lamps and other furniture items which provide some alternatives to student desks at different times of the day. I enjoy creating a classroom environment that feels like home to me and my students. I find that providing students with choices about where they sit and how they learn helps them become more independently minded and responsible for their own learning. Just today, I observed two of my boys who preferred to stand, but were working at their desks using poor posture. I gave them an opportunity to move to the back of our classroom and work on our storage spaces which are higher and allowed them to more comfortably stand and work. This may seem like a small thing, but I have found some students not only prefer to stand at times when they are working, but also learn better when they are given this choice. Building classroom community continues to be a top priority for me. 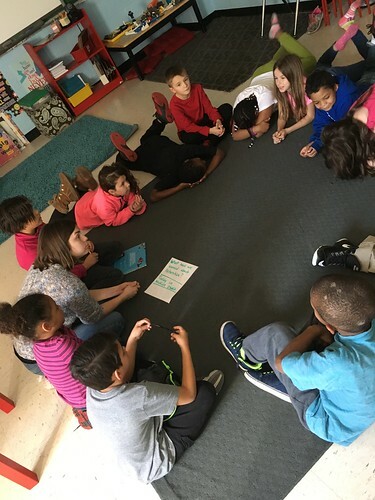 Finding time to have “class meetings,” to work on basic social skills, to build a classroom culture of respect, talking about character and the ways we embrace kindness by accepting each others’ differences are daily practices in our classroom. These themes are also strongly emphasized in our first novel study of the year, “The One Hundred Dresses” by Eleanor Estes. I have used Seesaw with my students the past three years at Positive Tomorrows, and am excited to be a part of a larger school community using Seesaw through the “Seesaw for Schools” program. All of the teachers in both our primary and lower schools (PK-K and grades 1-4) are using Seesaw as a learning journal and digital portfolio this year at Casady. Even though the year is just a week old, we have already seen the power of connecting with parents and other family members with Seesaw. Having taught in low socio-economic schools for most of my career, I am used to most of my students coming from single parent families. At Casady, however, most of my students have two parents at home and several have three or four parents because of blended families. Grandparents and other caregivers are also significant influences and supportive adults in the lives of my current students, so it is wonderful the “Seesaw for Families” app allows up to 10 connected family members to interact with each student’s journal. I am thankful to be starting a new teaching and learning adventure at Casady School, and look forward to continuing to share my journey with you and other connected educators! Every year teaching at Positive Tomorrows in Oklahoma City, my students informally find a song that they love and brings us together as a class. This year, that song was “Welcome to the 4th Grade” by Chicago first year teacher Dwayne Reed (@teachmrreed). I discovered it early in the fall semester thanks to Twitter, and it became my students’ favorite song for us to play during the day throughout the year when they needed a boost. They loved watching it over and over, and eventually I flipped it into our SeeSaw class so students could choose to watch it on their own too. Our class was extremely fortunate this year to work with Oklahoma A+ Schools (@okaplus) artist-in-residence Cindy Scarberry (@cscarb). Cindy is an amazing singer, musician, and music teacher, and worked with my students once per week as our “regular music teacher.” She is also the Executive Director of the Opry Heritage Foundation of Oklahoma (@rodeoopry). I shared the song “Welcome to the 4th Grade” with Cindy early in our school year, but didn’t think much about it until the last week of school when Cindy sent me a mp3 file of “Welcome to Room 108.” It’s an original remix of Mr. Reed’s song, but includes special lyrics for our class and our school. It was performed my students with Cindy’s help! I imported the audio into iMovie on my iPad, and used about 80 photos of our class from the year to create a music video. I shared it with my students in our last days of class together, and of course they LOVED it! Looking at this video now, it’s gratifying to see so many things we studied and learned together over the year. I had more turnover in my class this year than I’ve ever had, and it’s wonderful to see so many children that were part of our classroom community during the year but weren’t able to finish with us at the end. I am so appreciative for the work of Cindy Scarberry and my students in singing and performing this song! Thanks to Dwayne Reed for the inspiration. We made a lot of wonderful memories together this year in Room 108. Building classroom community has always been a very important part of what I do in my classroom. Using our morning meetings, “good news, bad news,” playing different games, creating our Room 108 podcast… these are all important elements in our routines. Since all of the students at our school our homeless, we always have high levels of transition and mobility among our families. This year in particular, however, it seems we have had a higher turnover rate. This has made it even more challenging to build classroom community. A few weeks ago, however, we had a breakthrough. For the second year in a row we participated in “Global School Play Day” (@GSPlayDay.) Scott Bedley (@scottbedley) is the California teacher who first alerted me to Global School Play Day a couple of years ago in a Twitter chat. Global School Play Day is an entire day at school dedicated to unstructured play. This is so important for all students, but particularly mine who may not have any toys of their own. Simple toys that other children may take for granted, like Legos or cars or dolls, are not things most of my students have when they leave our classroom at the end of the day. 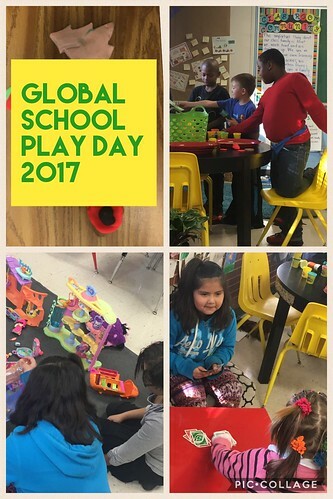 During’s this year’s Global School Play Day, I was so happy to see my students connecting with others who they do not normally play or even socialize with. 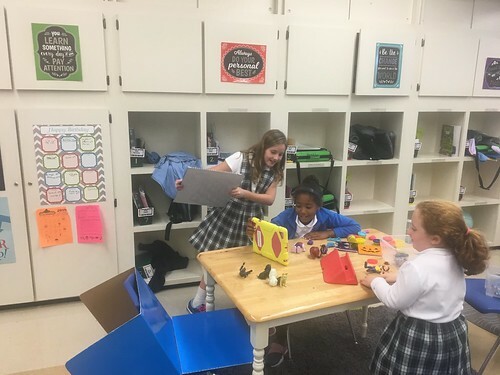 Multiple students created their own imaginary store using play-dough creations and play money, and other students came to shop or help contribute new items. The students recognized the need for store security, so someone appointed themselves as the security officer. The beauty of Global School Play Day is that teachers step away from directing activities, and students come up with things they want to play and do. Our classroom was filled with LOTS of imaginative play. By the end of the day, some students settled down to play board games like checkers, card games, Connect Four, etc. Interestingly, most of these games were played in pairs, although some played Uno in a group of four. At the end of the day, we reflected in a class radio show about what we noticed about each other during Global School Play Day and the ways we interacted. Students recognized what a relaxed day it was, and how much they enjoyed structuring their own games and activities. For students who often don’t have much of a say in their own environment, and definitely don’t have regular routines outside of school, this provided chances to make meaningful choices. It also gave them the opportunity to be free of many stresses which are regularly part of their lives. Read more about Global School Play Day in Scott Bedley’s February 3rd post, “Play Needs a Rebrand… #GSPD.” I am so thankful our school participates together in this awesome day of unstructured play. This day was a turning point in our classroom this year: Trust was built, relationships were strengthened, students opened up more about what is going on in their lives, and new friendships were started. I encourage you to bring Global School Play Day to your classroom next year! Tomorrow I am sharing a one hour workshop at Cleveland Elementary School in Oklahoma City on “Technology Projects for Enriched Assessment.” I’m sharing this as a fellow for Oklahoma A+ Schools. My goal is to help teachers learn to make, create and share using technology as a powerful tool for assessment. 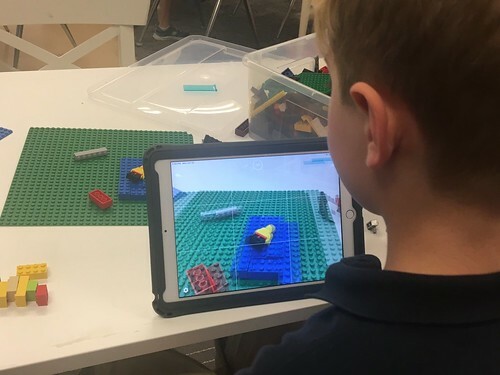 My husband included some of these project examples in his presentation last week, “Great Classroom iPad Projects and Activities.” I have included more of my classroom SeeSaw student projects in tomorrow’s presentation, which are “level 2 projects” in the iPad Media Camp project matrix. A Plus Schools are focused on integrating the arts into and across the curriculum, but also much more. The focus is not just “art enhancement,” when a teacher adds an art activity to an existing lesson. Quality A Plus essentials integration involves teaching common vocabulary and skills involving multiple subjects, in activities which blend the content areas in engaging activities. Since my classroom is 1 to 1 with an iPad for every student, I am very aware of the powerful ways technology can be used to support the A Plus Essentials. With so many schools now acquiring technology tools like iPads and Chromebooks, it’s become important for organizations like A Plus to help define what is important for teachers working to integrate technology into their lessons. Rather than simply “putting students on an app” to reinforce or teach basic skills, I am convinced technology tools should be used to enhance and amplify student creativity. Technology tools are used best in the classroom when students are making and creating, and these digital creations need to be shared both inside and outside the classroom. Last weekend at the Oklahoma A Plus Fall Retreat, I worked with a group of other teachers to brainstorm ideas for an “A Plus Technology 101” workshop. I am writing this post not because I have all the answers to this question, “What do teachers need in an introductory technology workshop supporting A Plus Essentials?” but because I want to clarify my own thinking as well as get feedback from others. What does it take to successfully integrate iPads into an elementary classroom? First, teachers need to have their own iPads to use, install apps, make and create. Teachers need to be supported and encouraged to use their iPads to make and create, because these uses do not necessarily come naturally for either adults or young students. Kids may learn technology skills more readily than some adults, but I have noticed many will not self-select creative iPad apps unless they are encouraged and/or required to do so by teachers. In addition to developing app literacy and a shared vocabulary which can be used with iPads, teachers also need encouragement and support to create “channels” for saving and sharing student digital projects. These can be channels shared inside the classroom as well as outside. Our classroom website, classroom.shellyfryer.com, is a Google Site we use as a “home base” for technology integration EVERY DAY at my school. I also use QR Codes and our classroom digital portfolio, SeeSaw, to share links to videos and other digital curriculum sites we use in lessons. The website I use to create QR Codes on my classroom computer is createqrcode.appspot.com. I copy and paste these QR Codes into Google Documents I print for students to use at different learning stations. Students use the free iPad app i-Nigma to scan QR codes and directly view videos or visit websites I’ve selected. When sharing YouTube videos, I usually put the link into Safeshare.tv, and share its provided link with students. Safeshare video links do NOT include related videos or comments, which can be distracting and/or inappropriate. This use of QR Codes, SeeSaw, and our classroom website is very important from an Internet safety standpoint. I never require my students to search online for a curriculum link we are using in class. That could not only waste time, it also could present multiple opportunities for students to be distracted or see inappropriate web content. Search skills are important, and students do practice searching for images to use in their projects, but only on websites and apps built specifically for student searches. These include Pic Collage Kids (which has a built-in kid safe image search tool) and the website PhotosForClass. In a Technology 101 Workshop, teachers need to also be introduced to apps which allow students to “show what they know” with media. This is very common vocabulary for my students and I in our classroom, and in the conversations I have with my husband (@wfryer) about technology. I have found, however, many teachers do not yet have enough app literacy to see the value and purpose of using digital devices in these ways. Technology tools like an iPad can empower teachers to use “enrichment assessment” activities with students which can provide extremely helpful insight into what students understand, have synthesized, and can demonstrate. Last week I shared an after school workshop for Oklahoma A Plus which was titled, “Enriched Assessment & Experiential Learning.” Some of the apps my students and I regularly use to demonstrate understanding are Opinion, Book Creator, Shadow Puppet EDU, SeeSaw, Pic Collage Kids, and iMovie. This year I have had to take things slower with my students using iPads, so we are not yet blogging, but will be using a classroom blog (we used KidBlog the past few years) to also “show and share” our learning. I believe teachers need encouragement and support to help their students share their work both inside and outside the classroom. My husband and I shared a mini-keynote last summer in Austin at the iPadPalooza Conference, in which we talked about these platforms and their importance. For me, this includes SeeSaw, our classroom radio show, our classroom YouTube channel, and our classroom photos on Flickr. All of these are linked from our classroom website, which is publicly available. After listing all of these different technology integration elements, it’s clear it would be hard to fit everything into a 1.5 hour workshop. It would also be hard to not overwhelm teachers. After reading what I have shared, what do you think are the most important elements to include in a “Technology 101 Workshop” that only lasts an hour and a half? Did you know there are over 1300 different species of bats, but only 3 of those are vampire bats? Also, vampire bats don’t attack humans, they usually prefer cows. These are just a few of the things my third and fourth graders have been learning this month about bats! This week (Oct 24-31, 2016) is National Bat Week! Lots of free resources and lesson ideas are available on www.batweek.org. 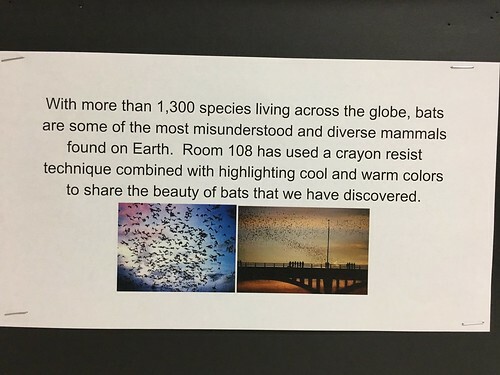 (@Bat_Week) The last two weeks Room 108 students at Positive Tomorrows have been studying and learning about bats, and this week we’ve already participated in two live webinars about bats. 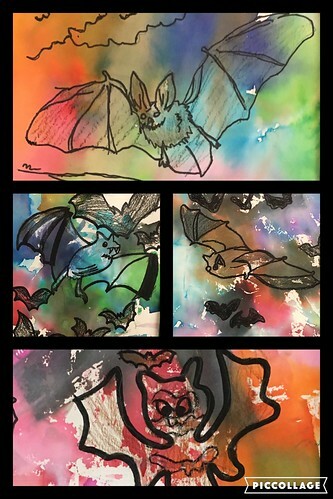 We’ve also created some “Crayon Resist Art” about bats, which turned out really well and I’ll describe in more detail in this post. Yesterday we participated in the free virtual field trip “Bat Zone Encounter” offered by Field Trip Zoom (@fieldtripzoom). Some of their virtual field trips are free, and others require that you pay a $50 annual membership fee. (We might do this after yesterday’s positive experience.) Many of the questions my students had were answered by the biologists in the webinar. Today we watched the first “Amazing Bats” live webinar offered by Bat Week, which is also archived online. It’s just 15 minutes long. 3 additional webinars are offered this week on Wednesday, Thursday and Friday, and if you can’t tune in live (it’s at noon for us in US Central Time) you can watch the recorded archives on YouTube. Last year my students learned to create “crayon resist art” for a project we did on Oklahoma state symbols. This is the lesson description I created, following the format we use as an Oklahoma A+ School (@okaplus). 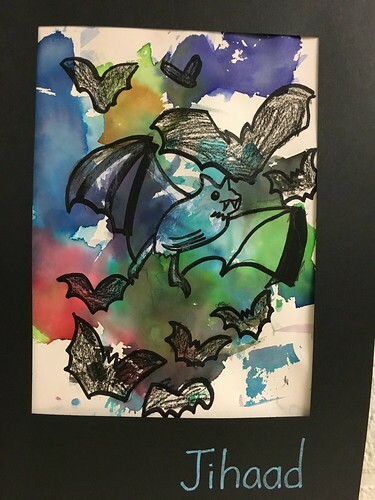 For the project, students first drew bats of their choice on their paper. They used crayons as well as black markers for their bat drawings. Then students placed a special kind of tissue paper, which “bleeds” color onto the page when you put some water on it, onto their art pages. We added small amounts of water on top of the tissue paper, and let the artwork dry. 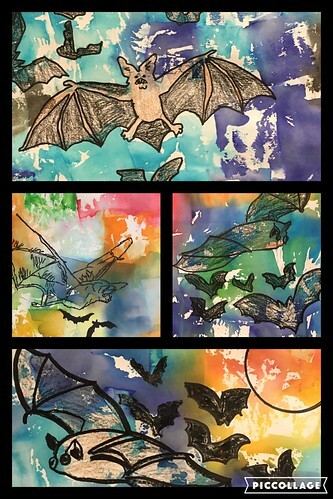 In this student project, notice how he used the “cool colors of the night” which surround bats most of the time as nocturnal mammals. He also used some brighter colors to show the setting sun. When students use wax-based crayons (regular crayons) to draw on their art pages, those places “resist” the tissue paper bleeding ink. After the water and ink is completely dry, students used a black sharpie pen to retrace over areas of their drawing they wanted darker. 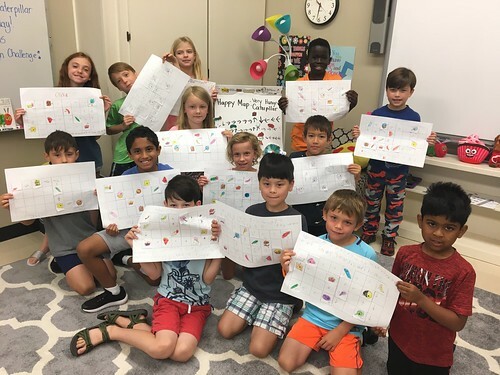 Students used traceable outlines of different kinds of bats to make their drawings, so most of them are scientifically correct for different bat species. 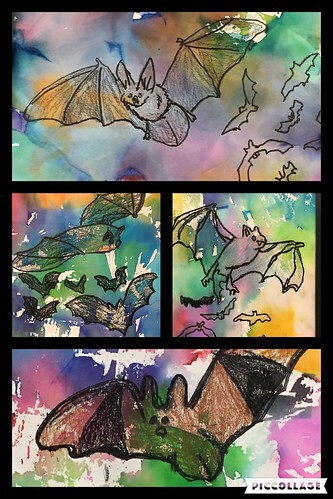 Here is a collage of several student crayon resist art bat week projects. I’ve shared all my students’ bat artwork in this Flickr album. I’ve also started a Twitter list composed of organizations and individuals focused on bat education and conservation. I also found this Twitter list of UK-based bat conservation and education organizations. I’ve followed both of these in Flipboard (@flipboard) on my iPhone and iPad, which makes this bat-related information stream into a digital magazine. I have created several “magazines” in Flipboard where I flip (or save) interesting articles I want to use for lessons or to share with others. One of the things the scientists in Monday’s virtual field trip challenged us to do is share our learning about bats with others! My students are working now on a paper slide video about bats, which we’ll be sharing on our classroom YouTube channel soon. Look for it coming later this week. You can follow me on Twitter (@sfryer) for more updates about our Bat Week learning! Also follow the Twitter hashtag #BatWeek for more bat facts, lesson activities, and related videos you can share with students!